“Should suicide be legal?” is one of those questions that will get an “errr” before an easy “yes” or “no”. It’s an unfair question. Suicide is bad, and we don’t want to encourage bad things; if it’s allowed isn’t that somehow encouraging it? But what does it mean to make it illegal really? Deterrence logic falls apart when people are willing to go to the final notch themselves. It’s on my mind because I’m writing a book about the idea of suicide contagion, and to understand that it’s helpful to know how the idea of suicide as a crime came to be in the first place. What is less important to that story is how the crime ended — but after reading Shelia Moore’s thesis on the subject I wanted share her amazing story of how suicide finally disappeared from the lawbooks. It’s a story about how a substantial change in the law was accomplished almost by stealth, by surprisingly few players. While the winds of social change might make a shift likely (or even inevitable) that it happens at one time as opposed to another depends on the actions of people, the physical steps they must take make abstract change concrete. This is the story of the people who decriminalised suicide. In the UK suicide is legal — and has been since the Suicide Act of 1961 (technically it was never illegal in Scotland). This is very recent — especially given the idea of an English “crime” of suicide is ancient. We know that church law prohibiting traditional burial received backing with a canon attributed to King Edgar (probably wrongly) in the 10th century. We know that around the 13th century (and probably before that, we lack the records) — the crown claimed the right to the possessions of suicides in a practice is called forfeiture. Richard II distributed the rights to collect the chattel of suicides as a form of patronage, and from this you can draw a straight line to the present day suicide inquests — which are the mostly pointless (and arguably harmful) vestigial remainder of this practice of taking stuff from dead people. In between there’s a lot of variation in how strictly this is enforced, it is strictest during the Tudor period when structural reform of the coroner’s system made them a more effective extension of royal power. After these structures were dismantled in the battles between Parliament and the Crown, enforcement again becomes lax. Over the 18th century coroners juries more and more return verdicts of insanity and by the 19th century it’s mostly a dead letter law. The exact mechanisms of this change in how people saw suicide is important to how we understand suicide today, and this is the direction I go in the book. But the legal story continues past when the old punishments were essentially being ignored. The law catches up with popular perceptions — burial at crossroads (already rare) was outlawed in 1821 and forfeiture for suicides was abolished in 1870 (having not been enforced for a long time). Given all the legal penalties were gone, what does it mean when we say that suicide continued to be illegal past this point? If something is a crime, it can also be a crime to even attempt to commit the crime. With posthumous punishment abolished, the idea of suicide as a crime now only really applied to the idea of “attempted suicide” — a new crime for the modern age. In medieval England references to attempted suicide tend to only show up in records alongside other crimes. This gives the impression that attempted suicide was historically nothing that the law took a special interest in. In the 19th century this changed and, at the same time as sanctions for suicide were decaying, a distinctive crime of attempted suicide emerged from the common law prohibition on suicide. The next century is littered with cases of people being fined or imprisoned after trying to end their own lives — continuing right through the 1950s. As a crime with no real victims ‘attempted suicide’ only came into being when it could be detected — without organised police these people would rarely have been exposed to an agent of the state. ‘Attempted suicide’ starts in the areas with established police forces (London and Manchester) in the 1830s and spread slowly over the rest of the country over the next fifty years. By existing to detect it, police forces created a new crime. This development is essentially about the increasing power of direct social control by the state. Where police forces saw their remit as maintaining public order they would take attempters away to restrict the impact on public order on the streets. The duty of the legal system to prevent suicide in custody (and frustrate those attempting to put themselves beyond the legal system) extended itself to all who might seek to opt-out of state power. The arm of the law extended beyond people talked down from ledges or fished out from beneath city bridges, even people who awoke unexpectedly alive in their own homes might find themselves arrested if someone had called for a policeman to help. The fact that suicide was still technically illegal made it much easier for police and the legal system to make claims on the bodies of the living that had previously only been made on the bodies of the dead. Control here was about more than physically removing people from the streets, this change needs to be understanding as a continuation of the medicalisation of suicide and the idea that suicidal individuals could be helped and saved. Should we just fish people out and leave them there? As a result of attempted suicide being brought into ‘the system’ in London a small mental health pipeline developed, with half of all attempted suicides arrested by the Metropolitan Police being sent to the remand prison at Clerkenwell — here the chaplain and surgeon gave advice and treatment and recommended actions for the magistrate to enforce at the end of remand. This might involve releasing people into the custody of family, or even helping them start a new life and emigrate. This system was pretty much unique to Clerkenwell. In urban areas where these police forces were most established enforcement was more common. There was a see-saw effect in terms of what would happen to those charged with the crime: where police forces arrested many people, magistrates tended to be more lenient — where they only arrested a few, magistrates tended to be harsher. And some were just harsh anyway. 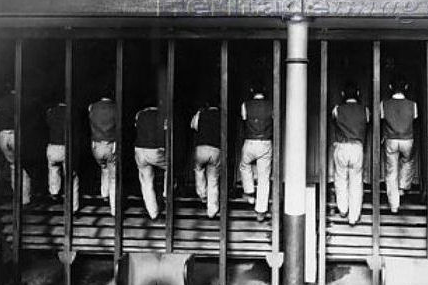 The treadmill was a giant wheel where prisoners would climb the ‘steps’ on the outside of the wheel as it turned. In some cases the wheels would originally have operated a mill and produced something useful as a product, but over time this became less common and the treadmill became an exercise in the virtue of pointless effort. This makes it an especially cruel punishment for a person who considered the effort of continued living pointless. Dickens had things to say about Laurie. This idea of difference of enforcement between areas seems to have remained right to the end. When Dr. Odlum (more on her in a bit) was trying to convince Chad Varah (the founder of the Samaritans) to support her quest to decriminalise attempted suicide, she raised this in response to his claim the system in London worked quite well for people : “If only the rest of England was like that. You would not believe what goes on — the stupid magistrates want to punish attempted suicides. You in London have no problem, but for that to happen everywhere it needs to be decriminalised”. At some point, the police came, since in those days suicide was still a criminal offence. They sat heavily but rather sympathetically by my bed and asked me questions they clearly didn’t want me to answer. When I tried to explain, they shushed me politely. ‘It was an accident, wasn’t it, sir?’ Dimly, I agreed. They went away. In 1921 this had been formalised with a revision to the Met’s General Orders, requiring that a “person brought to the Station as having attempted suicide and fit to be detained thereat, is not to be charged forthwith, but immediate enquiries are to be made to ascertain what was the motive for the attempt and whether there are friends or relations willing and able to take charge of, and be responsible for, the offender”. This meant that most detected suicide attempts were not acted on — but also that the burden of actual enforcement fell mostly against those already utterly isolated, without friends or family willing to take care of them. So when we talk about decriminalising suicide in the 1950s what we’re actually talking about is decriminalising the relatively young crime of attempted suicide as something detected by the police and dealt with through the justice system. I would reply as follows the present concept of suicide as a crime has its roots in religious belief. Although it is true that there is greater sympathy and understanding for suicides and would-be suicides, there is no evidence in my possession that the alteration of the basic concept would be universally acceptable to public opinion. I do not under-estimate the point that the hon. Gentleman has put to me; I am simply trying to assess the present position. But three years later, suicide is indeed decriminalised. What changed? One of Moore’s key points is that thinking about the Suicide Act as ‘liberalisation’ is a bit misleading as to people’s intentions in passing it. What it actually represents is the transfer of responsibility from one arm of the state to another better able to exercise control — in this case from the judiciary to the medical. It’s worth remembering that while the Wolfenden Report argued in 1957 that homosexuality should be decriminalised, it also called for research into causes and treatments. The creed of the time wasn’t that the state shouldn’t intervene in ‘social issues’ but that it should do so more effectively, with the finer control of the modern age. So given that the key change between ’58 and the Suicide Act’s passage in ’61 is that in 1959 the Mental Health Act is passed. The act provides both the basic premise that the medical rather than judicial means were most suitable for dealing with the mentally ill and established a framework for forced detainment through medical means. An obvious (and in fact, one brought up in the debate) objection to decriminalising suicide would be that it removes from the police to authority to detain someone for their own good — this objection was now answerable. While the Mental Health Act is a necessarily precondition, it doesn’t explain why the two laws are so closely positioned. The development was in some sense inevitable, but that quickly? And as a government bill? There wasn’t strong support in Parliament or any public campaigns for a change. For most groups the ‘err’ response meant they tended to be uncertain but generally satisfied with the status quo. The law didn’t impact many people, and some of those it effected it was considered to help. Moore argues that once the initial conditions existed, that the law changed can be attributed to three people: Dr. Doris Odlum, who outside Parliament paid a pivotal role in creating the idea of support for the change; Kenneth Robinson, the Labour MP who introduced the issue to Parliament, and Rab Butler, the Conservative Home Secretary who was in a position to make the change happen almost single handedly. If there was any substantial opposition to the bill it would have failed quickly and quietly — so an important thing to understand is why the opposition that existed never actually acted. Key to this is how the illusion of support from groups that might have opposed the change was constructed. The groups to worry about were the Church of England, who might object to any lessening in severity against such a serious moral issue as suicide and Magistrates, who might object to dismantling a “working” system. These groups were all defused by the creation of reports that certainly didn’t represent a greater consensus, but which were able to be presented as such to reassure Parliament that the force of the establishment was behind the change. Support from Magistrates was seen to derive from a report released by the joint BMA/Magistrates committee. This committee had previously released a report in 1947 calling for the decriminalisation of attempted suicide — however, the Magistrate members were not in agreement. This report was then revived by Dr. Doris Odlum, the chair of the committee in 1955 — who tried to get the current committee to endorse it. This ran into resistance, with some members arguing that keeping it an offence “brought it to the notice of the authorities who could decide on an appropriate action”. That the committee did eventually issue a recommendation to change the law was the result of long disputes within the committee, with one member (Seymour Collins) arguing the MA’s point that the police needed power to detain people who attempted suicide. Intermediate steps between this stalemate and the final recommendation involved resolutions for alternate legislation allowing for police to compel people to attend hospital, and approaching the Royal Commission investigating mental health and suggesting including provisions for attempted suicide within their recommendations. Odlum was persistent and kept it on the agenda. At one meeting where Collins wasn’t present the committee agreed that the courts should be removed from any processes involving attempted suicides. Collins then has to argue at a future meeting to reverse this — but this could by this point be defused with reference to powers in the now existing Mental Health Bill. At this meeting (of only five people) proposals were agreed that were represented to the Home Office (and in future, Cabinet, the Prime Minister and Parliament) as the formal view of the committee representing both associations. In reality the magistrates were being dragged along, while having enough of their concerns addressed not to kill it. The report would be cited again and again on the journey to decriminalization. Butler would construct additional support from Magistrates separately, but we’ll get to that in a bit. The other potential obstacle was the the Church of England. At the time the church was opposed to any change in the legal status of abortion, obscenity, blasphemy and divorce — it wouldn’t be unreasonable to assume that the same would apply to suicide. But again forces inside were creating the idea of agreement. In 1959 the Church of England Information Office published “Ought Suicide to be a Crime?” a booklet that argued (spoilers) that it shouldn’t be. Advance copies were sent to the Home Office and the Lord Chancellor by the secretary (Rev Dunstan) of the committee that produced it because “it was important for legislators to know the Church would not oppose legislation”. But this stance inside the Church was far more fragile than it seemed. While the report was sometimes presented as being started by the Archbishop of Canterbury, in reality the Board for Social Responsibility started the investigation itself, while notifying the Archbishop to make sure work wasn’t duplicated elsewhere. In the letter to the Archbishop, Dunstan’s focus was on “should attempted suicide remain a crime” rather than the wider idea of suicide. The committee itself didn’t attempt to find out opinions within the church and (softly) excluded members who might have opposed decriminalisation. Dunstan approached Canon Demart to join the committee, who was in principle on board but indicated he was against a change. Dunstan replied anxiously saying that the board wanted the question to be approached with an “open mind”, to which Demant replied “you are quite right that I had better say ‘no’ ”. On the other hand Dunstan invited Dr Odlum to join the committee — whose views on the subject could also be considered ‘unopen’. To be fair he was straining to find members at all at this point and it was considered including a women was a good idea. It was certainly a consequential decision. Odlum’s presence almost certainly shifted the results of the committee. The theological section of the booklet differentiated between four different kinds of suicide, and for suicides considered “voluntary and selfish” it argued the act could have moral guilt attached. It was suggested that this fourth kind would have a different burial service and the committee considered if this kind of suicide should remain criminal. Odlum reacted strongly to this, saying that retaining “suicide as a felony [was] contrary to the policy of the BMA and the Magistrates Association.” Of course, Odlum was chair of the committee this refers to and this statement almost certainly over-states the MA position. Odlum’s strong objection to any talk to guilt caused delays to the committee reaching agreement. The ambivalence remained in the final recommendation that “there should be an alternative Burial Service available for certain cases of suicide”. But the final report also argued that “attempted suicide should cease to be a crime” without qualification. However it strained Odlum to see any idea of sanctions, a report had been created that would serve the purpose of decriminalisation. The ambivalence within the church on the moral status of some suicides was not reflected in the legal recommendations. The report would be brought up over and over again in Parliament as an example of the opinion of the Church (or in one cases “Churches”) on this matter. I won’t go further into Odlum’s activities except in so far as to say she was busy — Moore notes that her “name appears in five of the six places outside Parliament where events occurred that were important to the Suicide Act: the BMA/Magistrates’ Association Joint Committee, the Church of England committee, the National Association of Mental Health, the National Council of Women, and the Home Office”. You can make things happen if you go to enough meetings. At one level how the Suicide Act became law is incredibly simple. Kenneth Robinson asks a series of questions to Butler about the prospects for decriminalisation of attempted suicide, Butler then decides the issue is important and Makes It Happen. Each of these steps raises questions. Robinson was probably put onto the issue by Odlum in the first place, he had an interest in mental health issues and in the minutes of the BMA/Magistrates committee there is a note to inform interested figures about their results, mentioning Robinson by name. This is a circular endorsement in that the opening of the church booklet mentions “In view of growing opinion among, doctors, magistrates, Members of Parliament and others” — in fact there was really one only Member of Parliament talking about this but collectively this circle created a powerful image of elite consensus. The inclusion of the decriminalisation of suicide in Roy Jenkins’ 1959 The Case for Labour came from Robinson, otherwise there is no sign anyone considered it a pressing issue. After some general questions on if decriminalisation would be pursued. Robinson asked for Butler to provide the average sentences of those imprisoned for attempted suicide. Moore suggests this is the point which it gets on Butler’s agenda because the answer showed that there were actually a fair few people being put in prison — but also that most suicide attempts weren’t being prosecuted. The first fact suggest decriminalisation as a partial solution to a practical problem (lack of prison space in the ’50s) and the second would have stirred Butler’s reforming zeal. While we might see 10% of known suicides charged and see the 10% as the problem, for Butler it would have been the opposite — that’s 90% of attempted suicides who the system isn’t helping. For the liberal paternalist, this is a failure of government. Butler was a political operator with a reputation for both subtlety and an aversion to outright conflict. He had also assembled an unusual political position, at this point he was the Home Secretary, Leader of the House of Commons, and chairman of the Conservative Party. In a wonderful turn of phrase, the Reverend at his memorial service said Butler “accepted the stark realism of Christ’s command: ‘Be ye therefore as wise as serpents’ ”. Butler hence constructed the passage of the bill so that it could fail silently without damage to any wider agenda, but also so that it had the best chance possible — by circumventing normal procedure and muting any area where it might run into difficulty. Butler’s first action on the subject was a month after the 1959 election when he referred the issue to the Criminal Law Revision Committee. This was a group of legal experts who would consider areas of law suggested by the Home Secretary and present recommendations for reform . Importantly Butler didn’t ask them if suicide or attempted suicide should be de-criminalised — he asked if this were to happen, what new law would be needed to continue to criminalise assisting a suicide. This had two uses. This language would be needed to address foreseeable objections to allowing assisted suicide and the CLRC went so far as to commission parliamentary drafting of the clause in question, something that would normally be sanctioned separately by the Chairman of the Future Legislation Committee (in this case that was Rab Butler). The second use was possibly more important: the committee had returned another document which could be used to give the appearance that legal big beasts were in agreement with the change. If Butler had actually asked the real question, disagreements within the committee were likely, pretended that there was agreement was much more useful. In June 1960 there was no mention on the list of bills proposed to Cabinet except for an item on the list of possible Private Members’ bills. In October Butler makes his move and promotes it to a government bill in a matter of days. He writes to the Lord Chancellor recommending the CLRC’s report be implemented and in a meeting of the Cabinet Home Affairs committee (which he chaired) creates agreement that the bill should proceed. He writes to the Prime Minister (Macmillan) informing him of this, explicitly saying the CLRC recommended suicide and attempted suicide should cease to be offences — when in fact they explicitly say they don’t discuss it. He reassures Macmillian that the CLRC “has no less than 4 Judges and other notables, so the backing is weighty”, and that the Church Assembly Board for Social Responsibility had published a report along the same lines. As Butler put it, it was “not likely to be controversial”. When it was raised in Cabinet, it was the fourth of five items for discussion — positioned after a controversial NHS issue which had a “long and heated” discussion. Butler then raised the Suicide Bill, explained it had “widespread support” and secured approval without further discussion. This circumvented what would have been the normal process for a government bill, avoiding both the Future Legislation Committee and the formal Cabinet meeting for discussing agreed bills. Butler had managed to sidestep several possible obstacles to passage. In February of 1961 the bill was introduced quietly in the House of Lords. At some point Macmillian seems to have cooled on the bill and sent Butler a note saying “Don’t pursue this idea”. Butler then got a new junior minister to try and take the bill through the Commons and distance himself from the process (making it easier for the government to drop if it failed), saying about the note “I’m not going to answer this… let’s go on with it in a minor key and see how we go”. Debates on the bill were scheduled for Fridays (when attendance and coverage was lower). In the Second Reading references were made by several speakers to the broad groups now taken to be in support: the doctors, the magistrates and the Church. The in-reality narrow beams of support were managing to take the weight of parliamentary scrutiny. At this stage the bill was almost fatally derailed when Leo Abse (whose name I only ever seem to see in the written equivalent of exasperated tones) “talked out” the bill, by starting to speak just before the end of allotted time. In his memoirs he relates that Robinson was angry at him for this (as they were both in support of change), but he relates that he “would rather lose the Bill than corroborate in the morbid stealth of the government”. He was confident the issue would return. That he happened to be correct is either a tribute to his political acumen or plain luck — the bill did in fact receive extra time (probably through the ever unseen hand of Butler). During its passage through Parliament there was discussion and disagreement on various points, but most objections could be referred to either the new clause on assisted suicide or to the Mental Health Act. In the end the Act passed was exactly the same text as the initial bill. When the Suicide Act became law a circular was sent out from the Home Office to all Chief Constables telling them that “it will no longer be an offence to attempt to commit suicide”. While the discussion was carefully focused around the hundred-year-old crime of attempted suicide, this was a significant change in the legal idea of suicide — accomplished by a combination of stealth and bluff. There are a number of lessons we might learn from this. Decisions are made by those who show up. But it also helps if you make sure the “right” people show up and to arrange it so they can speak for the “wrong” people. If the wrong people absolutely must weigh in, give them a way to agree with you, even if they don’t. The appearance of consensus is important, and also keep the ball moving so that no one notices it might not really be there. These lessons are at best morally neutral. But perhaps the key thing to take away from this is that a small number of people, positioned themselves in the right places, can have a surprising effect on history — and leave little trace of what they did or why. This is extensively cribbing from Shelia Moore’s 2000 thesis — The decriminalisation of suicide — which I found such an interesting story I wanted to see if I could boil it down for a different audience (Moore sadly died eight years ago, so isn’t in a position to share her work). If you’ve found it interesting do, do read the whole thing. There’s a lot more in there. Macdonald and Murphy’s Sleepless Souls — Suicide in Early Modern England has a lot on the ancient to early-modern progression of the law on suicide. Alexander Murray’s Vol 1 and 2 of Suicide in the Middle Ages is useful in a number of areas — but specifically here on the lack of attention paid to attempted suicide. Olive Anderson’s Suicide in Victorian and Edwardian England is excellent on the rise of the idea of attempted suicide. Al Alvarez’s The Savage God is fantastic on the history of art and literary engagement with the idea of suicide.